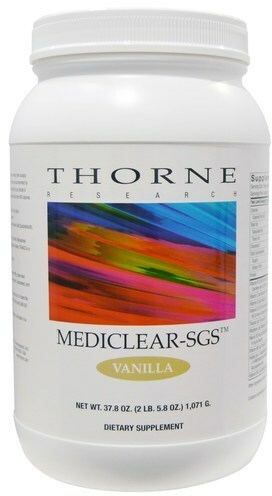 MediClear-SGS is a rice and pea protein supplement with a complete multi-vitamin/mineral profile, additional detoxification cofactors, flavonoid phytosomes, and sulforaphane glucosinolate (SGS). The liver and other organs of elimination in the body are challenged by environmental and diet-related toxins, as well as the inability of nutrient-deficient vegetables, grains, and fruits to provide all the nutrients that are necessary for detoxification. MediClear-SGS is a low-allergenic rice-and-pea-protein-based supplement that is formulated to support liver and colon detoxification. It offers essential nutrient cofactors and a complete range of vitamins and minerals in their most absorbable, tissue-ready forms. MediClear-SGS offers enhanced liver support by adding sulforaphane glucosinolate (SGS) – a natural substance from the seeds and sprouts of select broccoli varietals. SGS provides effective up-regulation of the body's natural phase II detoxification enzymes, and is an indirect antioxidant that provides long-lasting cell protection from free-radical damage. Health-care practitioners know that many challenges to health can arise when a patient's liver is not functioning as it should, such as poor digestion, imbalances in intestinal bacteria, and fatigue. MediClear-SGS includes beneficial detoxification nutrient cofactors, as well as an array of extra nutrients and botanicals. MediClear-SGS also contains curcumin, green tea, and grape seed extracts in phytosome form for enhanced absorption and optimal delivery to the tissues. Phytosomes are specific plant extracts bound to phosphatidylcholine, which greatly increases the absorption and blood levels of the desired botanical constituents. MediClear-SGS contains the vitamins and minerals that support the liver's detoxification actions. These nutrients are provided in the most absorbable, best utilized forms, pyridoxal 5'-phosphate (active vitamin B6), L-5-MTHF (active folate), methylcobalamin (active vitamin B12), and well-absorbed mineral chelates from Albion Laboratories. In the liver's phase I detoxification process, harmful and unwanted fat-soluble substances are converted to intermediate metabolites by a group of enzymes called cytochrome p450 enzymes. The intermediate metabolites are often more reactive and potentially more toxic than the original substances. The liver's phase II detoxification process involves the attachment of other molecules onto these intermediate metabolites, which makes them non-toxic and water-soluble, thus allowing their elimination via the urine or intestines. Rice and pea protein are used in MediClear-SGS because of their low incidence of allergenicity. It is far more likely for dairy or soy protein to initiate an allergic reaction. Using rice and pea proteins facilitates the elimination of most allergenic proteins from the diet, while maintaining high-quality protein intake.